The 2013 follow up to the 2001 original Luigi’s Mansion, sort of slipped me by when it came out. Christmas 2014 and it found its way into my Christmas stocking loving selected by my then girlfriend (now wife). At the time I wasn’t that into my 3DS and while I’d popped in quickly to have a poke around, was more concerned with my Xbox 360 and its current slew releases. Come 2018 and I finally made the return trip to finally put these ghosts to bed. I played on a N3DS-XL and I must say; this game looks incredible in 3D. Like, wonderful. The scenes where you’re in dusty drawing rooms, with ceiling fans spinning slowly and the wind blowing curtains about is truly impressive, it just works so well in this game dark but vibrant game. I’m in love with how good this game looks and has taken the mantle from my previous best 3D game of Z: A Link Between Worlds. This is perhaps Nintendo’s original idea come to fruition (albeit by a different developer overseen by Nintendo), as the first game at one point was down to be a stereoscopic 3D title on the GameCube. I do have a few issues with the hardware though, many a time my play time was cut short due to battery issues, I understand that having the 3D on, with the brightness up full will chomp away at it but a few times I was forced to plug in to stop that militant, red-blinking-light. The other thing is my own anatomy perhaps but after long session, especially boss fights my hands would ache badly. I don’t think it’s a getting used to it issue, I think it’s a combination of the thin form factor, slightly awkward layout and tight tense action of the game. The Music is stellar Nintendo, it gives great sense of atmosphere and character. It has a slightly different sense of mood than the first game I think, a touch more jubilant. The experience is heightened I think by the fact that it’s a handheld and very much benefits from the accessibility and results of being used in conjunction with headphones. The immersion of the personal handheld experience, the incredible 3D and headphones put’s you right in the moment, playing it in the dark is PERFECT. None of which are essential to make the game enjoyable but like a good jus, or garnish on meal it can heighten the enjoyment. The atmospheric drone in the third world Clocktower is awesome. Really atmospheric, 2001 Space Odyssey vibes. The sound design in parts of this game is right up there. Prof E Gadd’s tune is still pumping, great tune. It would make a great ringtone. The characters are funny, each one putting across its own personality via little animations, thoughtful design and body expressions. The weakest of the cast is Luigi, perhaps unsurprisingly, the main antagonist, King Boo, is soooo cool with his hulking presence, mean dark eyes and jewel crown. Proff, E.Gadd, is his usual slightly selfishly agenda’d self and what seems to me like an eastern European charm. The ghosts are possibly the stars of the show, with again individual stereotypical character design to match their appearance. The cheekiness of the green ghosts capturing what seemed like to me an adolescent mischief making pest. The controls are OK, the ability to use the gyro-scope in the 3DS helps – if you’re used to that type of controller input I feel it’s something that you can really make the most of, other than that you‘ll be constantly flicking between X & B to aim up and down with your Poltergust, something that initially never felt totally natural to me and in a panic would result in all sorts of crazy moves but by the third area, I was totally down with it, not even thinking about the control inputs and pulling off all kinds of crazy 360 sucking and blowing moves. The ability to upgrade your Poltergust and its attachments is neat, although feels kind of pointless and tacked on. Giving longer duration of Dark Light usage on your torch and a stronger final capture mechanic, which just sort of scales with the ghosts, so in effect it doesn’t really feel like much of an upgrade, although it does make going back to mop up easier as the ghosts in previous levels/areas are quicker to capture. Comparing it to the first one, unfairly perhaps but naturally, it doesn’t feel as good as on the GameCube controller which was a perfect fit and gave fabulous feedback with the triggers, proper analogue stick and rumble. Snagging the ethereal pests is still joyful though, it’s still fun and satisfying to pull one in even if it’s one of the basic ghosts, this is where the game shines. It’s basic moment to moment play makes the interactions fun and less of a chore – damn fine game mechanic that. The new process of being sent out on a mission by Pro E.Gad, then doing a set piece or mission in the same environment feels a lot like the Mario 64 formula, or the more recent Mario Odyssey set up, which Nintendo has been drawn to over the last decade or so. This, I think perhaps draws away some of the relationship you may have with the environment, like the Mansion in the first game. You got to know every knock and cranny of that original mansion and built up a sort of understanding of it and its character, Dark Moon steps away from that type of design and instead gives you a smaller area, locked off from the larger environment in almost bit sizes chunks. It's done very well and is very video gamey in the sense that it’s a series of tasks, in a small space that once completed finishes the level. Like I said, it works but overall gives a very different type experience over the original game. The action is more frequent which takes away the some of the excitement of finding a new ghost, or working out the puzzle that reveals the ghost. There’s one section in the game where you have to capture 52 ghosts – that’s more than are in the original game I’m sure. There are hidden areas that sort of appear occasionally when you find a hidden passage or route, this then presents you with a Hakoniwa style red coin dash challenge, which if completed will reward you with a bunch of gold bars, meh. What’s annoying is that once you complete the mission task, sometimes without being abundantly clear that you are doing so – it will pull you out back to E Gadd without the opportunity to look about, or pick things up – a few times I missed out on loot or things I’d spotted as I’d unintentionally fulfilled a task and got zapped back to Gadd. I didn’t like that. The games not hard, the difficulty comes from the unknown, not knowing the trick or the necessary dance required to make the ghosts vulnerable. The isolation is lost from the first game though I feel, I’d spend tens of minutes sometimes wondering around trying to work out what I had to do to trigger ghost to appear, or where to go next. Often, I’d do the old switch it off and come back to it a day later trick. With Dark Moon you can simply just keep pushing and you’ll chop through jt in no time. That said, some of the Boss fights (Clock Tower & Treacherous Mansion) are challenging and I failed them a few times, lambasting the pull of a ghost or a non drop. You tend to get funnelled into the direction and pointed to the task at hand but again without any sort of clear indication that it will end the mission. It’s not terrible and perhaps in isolation is perfectly enjoyable but having become rather familiar with the original game and beginning to love the original character of the original mansion – this game misses something and because of that tends to go off in its own direction at its benefit and detriment. The final area of the game, the Treacherous Mansion, is where things start to get complicated and arguably better, using multiple items in different areas to solve puzzles really started to get my thinking and one puzzle froze me out for almost an hour. The later trickier parts of the game, in particular the boss battles can become problematic as more and more ghosts re thrown at you. What lessens the experience is that there doesn’t appear to be any sort of rhyme or reason as to what will drop from the ghosts as you defat them. To first enable the chance of a drop you must capture a ghost with a turbo, or revved up part of your Poltergust, if the ghost is weak enough you will consume him in a single gust. Then, maybe you’ll get some coins, a gold bar or a heart. Not knowing what you are going to get can make the more frantic battles feel frustrating, as holding out for a heart and not getting one can come off as feeling a bit cheap as you die as a result of one just not dropping. There’s a considerable amount of replay-ability once the credits have rolled, with jewels to locate in each mission and hidden boos to discover in each area. The rewards though, are a touch flat and once I’d gone back to the first area and cleared it all, I didn’t really have much vigour to do the rest for the other areas – especially that you still must complete the whole level, you can’t just back out. For finding all the hidden Boo’s in a level you’ll unlock a new, final mission after the Boss fight for that area. Unfortunately, it’s a time attack mode, that pits you against the layout of the area and how quick you can catch a selection of ghosts. The jewels gave you slightly more, slightly. Once you’d cleared the area and found all of its riches, if you go to Proff, E Gadd’s vault you can view your goodies. 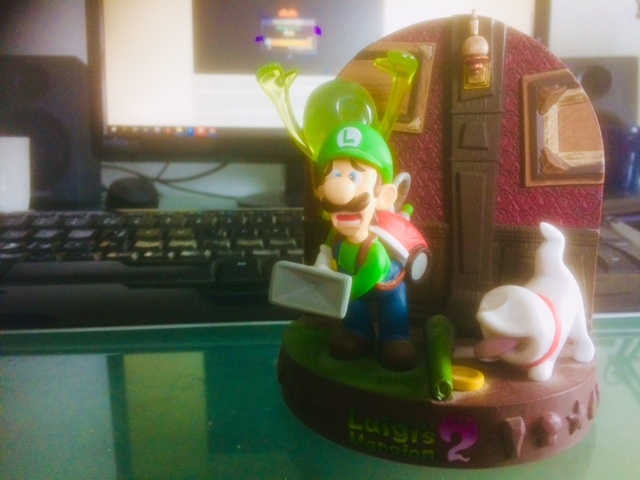 Once you’ve cleared a section of jewels, you have the option to view a statue, which is simply a 3D statue that you can rotate of Luigi in a pose. I can only assume that if you collect the other jewels they’ll give you different pose. I was only a few jewels out of clearing a few other areas but the fact that you have to finish the mission as well, makes it a much more time-consuming chore. Luigi’s Manion 2 has a co-operative multiplayer element also, to which I had no real inclination to try. Once you complete the fourth area and polish up the penultimate Dark Moon piece, before going into the final area for the first time Gadd suggests that Luigi should have a look at the Thrill Tower, to polish up his ghost hunting skills. I was shocked to see that there were people still playing it, it took two failed connections before I successfully joined a game. Proof that five years on there are other people still playing this game – unlike some of your other, perhaps ‘bigger’ games. The premises is that you can join up with three other players to co-operatively clear floors of a spooky tower, completing specific challenges before you progress to the next floor. Each time you clear a floor, before you teleport up to the next floor you’re given a red coin dash task to collect as many red coins ad you can. These turn into tokens that allow you to roll a slot machine for specific buffs, things like maps, or dark light goggles that allow you to see hidden items, or Poltapup (Ghost-dogs) paw prints, or even more powerful Poltergust upgrades. It seems to be a well thought out mode, with items and environment assets unique to this mode. Every fifth floor the game plates you up a boss to beat. Flying around with other Luigi’s all combating a giant ghost boss, is wonderful, it really works well, and you soon start to recognise your partners style and begin to complement each other. Once you beat the boss, dependant on what sort of lobby was set up, you return to the MP screen and reap your rewards, to which the only thing that seemingly carries back to the single player game is a slight cache of gold coins. The rest seems to ad to your MP level. Overall I enjoyed it, it was good. Not as powerful, or as captivating as the first game but this took the premises and moved it on a step to a more action-based game – to its detriment I feel. The original had some wonderful moments and very vibrant ghosts, that’s not to say that this doesn’t, it just doesn’t hit the same sort of spot as the first. This is my finished file, it would be great to hear what other people thought of it and ended up with. What's with all these legendary posts lately, mate? I like the first Luigi's Mansion, which is kind of a kid-friendly version of RE with a nice mechanical twist. I should probably replay it someday. Haven't played the second one. A full-blown third part on Switch might be nice! PS: Stop flaunting your superior 3DS, please. Show-off. The sequel is really good fun and one I feel got overlooked by a lot of people. I think I only know a few people who played it despite there being what felt like a massive cry for a sequel before it happened. It is bloody long though but thankfully it’s quality doesn’t diminish throughout overall. I've just been enjoying puting down a few thoughts on things of late, I'm glad someone is finding them interesting . Yeah, the first one is still the standout entry for me, although this one, on it's more unique platform is still well worth a look. It's still a very competent game, albeit a more action focused one. Yeah, it does keep going for a while, although it never felt too long. The ghost capturing mechanic is so satisfying it never rally felt like a chore and the puzzles were different enough to stop it getting too repetitive. Yes, mate, tap me up if you fancy clearing a few floors on Thrill Tower . Wonderful post. I need to get back into this one. At the time I was a bit disappointed with the multiple mansion approach, as I missed the backtracking and exploration of the first game, but this has its own strength, with a wider variety of environments. One thing I do truly sorely miss is the more human-like portrait ghosts, with all the personality they brought to the table. At the time I was a bit disappointed with the multiple mansion approach, as I missed the backtracking and exploration of the first game, but this has its own strength, with a wider variety of environments. When I first played this, when I first got it, even though I'd only played about a quarter of the original, I understood what it was all about and came into the second entry with a certain amount of expectation surrounding gameplay. Upon discovering that it wasn't what I was expecting at all, I kind of disregarded it for what it was and put it down. The passing of time meant that when I did pick it up again, I was ready for it and knew what I was going in for, which helped massively in terms of sticking with it and enjoying it. What a lovely gift, I've had more than a few looks at these on eBay. Yeah, I imagine that's how it will work for me as well. I just replayed the first level and I’m so tempted to replay it all again with a guide to get the extras. Thinking back on it the game isn’t overly long at about 12 hours on my save file. I just remember it being long as I was comparing to the original. It’ll be interesting to see what they add to the 3DS version of the first game, you just know they won’t leave it alone and add some bonus bits and bobs! Yeah man, the 3DS remake has got a boss rush mode. Sounds cool, but it isn’t enough for me to pick it up on the 3DS sadly. Plus the fact that I only recently this year went back and played the original on my GameCube. Still, it’ll be wicked for first timers on the 3DS, imagine how cool it will be to play through that on that console. A full-blown third part on Switch might be nice! All the hints were there weren't they . I was convinced that that opening scene of the Smash Simon Belmont announcement was a new Luigi's Mansion, considering the effort that went into it - but alas my hopes were dashed when he was murdered. But hey, it's coming and all the noises and hints point to something exciting !! And now I really need to get on with pt. 2! Great opening post. Thinking I need to go back to this game. I really hope people go back to this, as I thoroughly enjoyed it. It's not brilliant but very charming and slightly more satisfying than the first due to its infamous mission structure. If Luigi's Mansion 3 doesn't come out Halloween 2019 then it's a missed opportunity in my eyes - which should give people a good chance to get this finished before the new one.